After getting hammered by several wine critics, I just had to get my hands on a bottle and find out what was so awful. After opening the bottle, I understood the problem encountered by the pundits — Lyeth Meritage is a raw, rough-around-the-edges wine that does not immediately show well. Subsequently, the wine was given low ratings and ambivalent reviews. But this doesn’t mean the wine isn’t worth buying — rather, what it means is that Lyeth Meritage does not impress critics in a typical wine reviewer’s environment. Lyeth Meritage is an example of a wine hurt by “the system”. Tasted within minutes after opening, its nose is closed, it has a harsh bite on the palate, and at best it seems clumsy. However, if you open the wine, decant it, and let it breathe for 10-20 minutes, you will be rewarded by ripe red and black berry aromas and flavors, some black pepper, a hint of licorice, cardamom and clove spice, firm tannins, and ample acidity — with the initial harshness replaced by a smooth texture and fairly long, ripe finish that might end up just a touch too hot. Let’s get something straight: this is no mind-blowing wine — but it isn’t supposed to be. For about fifteen bucks, you should expect a wine that matches well with a similarly priced steak, and gives you a bit of complexity to ponder over an after-dinner cheese course. Said another way, it should be about twice as good as a seven-dollar wine, and about half as good as a 30-dollar wine — and it is, in both cases. In fact, this wine might be a little better, though time will tell. The amount of ripe fruit and complexity (earth, spices, menthol, tobacco, herb) that it is showing now, wrapped up by generous tannins, leads me to believe that this Meritage will benefit from 3-4 years in the cellar. Here’s the good news: since the “important” wine mags gave this wine less-than-stellar reviews, you should be able to find this easily, and perhaps at a discount. Enjoy it now with a fatty ribeye, porterhouse, or cheese plate, or put it in the wine cave and forget about it until 2008-2009. Buying a bottle of Malbec can be a somewhat mysterious experience, as the grape — much like Chardonnay — can be so many different things. Think of Malbec as the Peter Sellers of grapes: so many disguises and personalities, and you’re never quite sure which one you will get. Of one thing there is little doubt: Malbec from Argentina is nearly always a good value. (Though we’ll see how long that lasts, as more and more people are discovering the grape, and demand is increasing.) However, it can be soft and easy, lively and vivacious, or bold and dominating. There are simple Malbecs that you may chill for a while and enjoy with chicken salad, and there are complex, full-flavored, tannic Malbecs that you store in the cellar for 10 years or more. 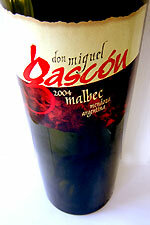 Never having the Gascon Malbec before, I had no idea what to expect. Since it cost only about nine bucks, I figured there was a good chance it would be on the fun and fruity side, soft, and easy drinking. Boy was I wrong, and knew it the minute I stuck my nose in the glass. Green, herbal, earthy aromas dominate the nose, saddled by black fruits, black pepper, and a touch of tar. On the palate, it’s all black, ripe fruit, with black pepper, tar, and hints of tobacco, wrapped with ripe tannins and a good level of acidity. The finish is mostly tar, tobacco, and black pepper, and is longer than expected, carried by the medium-high level of tannins and acidity. Final verdict? This is an excellent value, a bold red wine begging for steak, chops, or cheese. And if you like a wine in this style, it is fairly enjoyable all by itself. Note: I recorked the half-full bottle and stuck it in the fridge, and two days later it was nearly as enjoyable as when it was freshly opened. To me that makes it all the more valuable. While it’s obvious that most wines are made from grapes, it’s uncommon for a pontificator such as myself to describe one as “grapey” … we wine snobs and scribes are more apt to attach descriptors such as “forest-floor earthiness”, “musky feral aromas”, “baritone richness”, and my recent favorite, “umami character” (you can’t make this stuff up!). 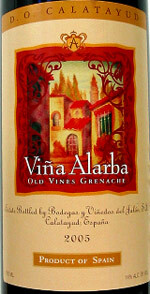 However, I’m going to go against the grain and say that Vina Alarba Grenache is simply, “grapey”. It smells grapey and tastes grapey — as in grape juice or grape jelly. It’s more than that actually … the grapey-ness (is that a word?) is part of the open, ripe fruit aroma that also has a hint of red licorice. In the mouth you get the same grape jelly character along with red licorice and similar candylike flavors upfront, held together by mild to medium acidity and mild tannins that give enough structure to match with a wide variety of foods. Despite the perceived sweetness — which by the way makes in an excellent match for roast duck with plum sauce, and meats doused in BBQ sauce — the wine finishes dry, with a balanced aftertaste. In some ways it reminds me of Beaujolais Nouveau … only, a Nouveau with more structure, seriousness, and length. Though a wine connoisseur with a cellar full of Bordeaux would likely scoff at this wine, it has its place with those of us who have an appreciation for solid wines under seven dollars. Match it with the suggestions above, Mexican fare, and non-snobbish appetizers (i.e., pigs in blankets, “port wine” cheese, hot poppers). This wine also qualifies as an excellent introduction to the “white wine only” crowd. One of my favorite varietals in the world is Barbera, particularly from the Piedmont region of Italy, and specifically from the areas of Asti, Alba, and Monferrato. The nice thing about Barbera imported from Italy is that, generally speaking, you get what you pay for, and there are excellent bottles starting around 12 bucks all the way through around forty, With my meager salary, I tend to stay in the under-$20 range, and there are plenty of good values to choose from. At the same time, I’m always on the lookout for an Italian Barbera at ten bucks or less. They’re hard to find, but usually worth my hard-earned dollars. So when I saw this bottle from Suri for $9.99, I pounced on it. 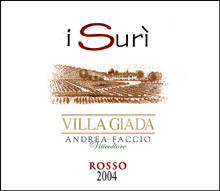 It’s made by a winery called Villa Giada, which is located in the middle of Piedmont, somewhere between Alba and Asti (technically, this wine is a Barbera d’Asti). Winemaker Andrea Faccio ferments the juice in stainless steel and allows it to go through a full malolactic (this is geek talk for a second fermentation, whereby malic acid is converted to lactic acid, and the result is a smoother, rounder, mouthfeel). Though not the best Barbera I’ve ever tasted, it did not disappoint. The nose is slightly subdued, and not a good hint at what the palate offers. I got some earthy, herbal aromas, with hints of black cherry layered below. In the mouth, however, I was welcomed by bright, fresh flavors of black cherry and black raspberry. This wine is ripe and full, balanced by mild acidity and mild, ripe tannins. It finishes with harmony, no one element overpowering the other. I enjoyed it on its own, and as a match for Manwich-brand sloppy joes. It will go just as well with pasta in meat sauce or marinara, burgers, tacos, mac and cheese, pizza, and any dish that includes a tomato-based sauce.